It's been two weeks since I touched down in Auckland and the city continues to grow on me. I intended to update my blog a little sooner, but have been keeping myself busy between my research, going on a weekend adventure, and making new friends. Sorry if you tried to access my site this past week and it was down. In simple terms, the domain name hadn't officially transferred to my possession/I had not verified that squarespace would manage the site instead of google - who I bought the domain through. Anyway, it should be fixed now! Last weekend we took a ferry ride out to Rangitoto Island, which is in the Hauraki Gulf just northeast of Parnell where we are staying. The island was formed by a dormant volcano which erupted approximately 600 years ago. It lurks in the background of Auckland's skyline and locally is a well-known adventure spot. When we heard there were lava caves to check out, we really knew there was no passing up a trip to Rangitoto. The hike to the top was about a 45 minute trip with a few stops to look at the views of Auckland. Once at the summit, the views are simply exquisite in every direction - even with the rain and the clouds. Perhaps another day will be spent exploring Mototapu, Rangitoto's non-volcanic neighbor. Inside Rangitoto's lava caves. Picture taken by some other island adventurers I ran into underground. On the way down Rangitoto we met some French students who are conducting research in various science and engineering fields both at Auckland Uni and down in Wellington. It was cool to get their perspective on studying and working abroad and learn a little more about the French educational system - as well as just make some new friends. On Sunday last week, the 8th, we went to the Auckland Museum. It is a fantastic museum. Nearly the entire first floor is dedicated Maori culture and other Polynesian, Melanesian, and Micronesian cultures. The wealth of information about New Zealand's past and its recent history was exciting to see. 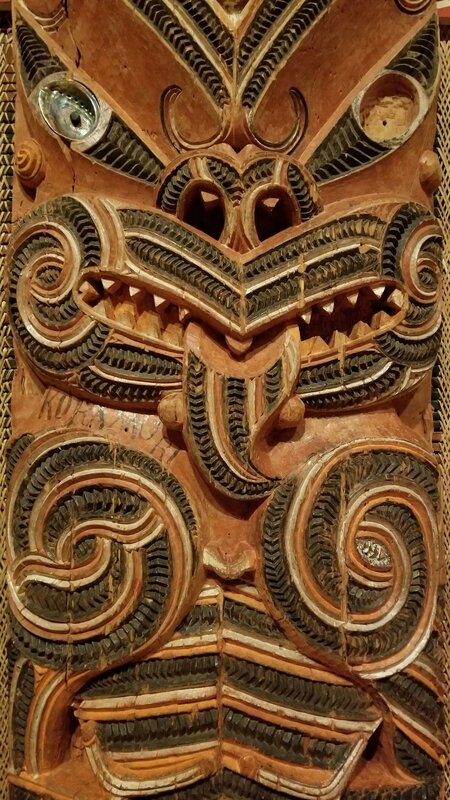 The numerous artifacts housed in the museum presented a rich picture of Maori culture and its deep roots on Aotearoa (Maori name for New Zealand). The very first experience museum-goers have is to walk into a traditional Maori meeting home (wharenui) which is being restored by the museum's conservation team. The wharenui is covered in beautiful art and the craftsmanship of the carvings, the columns, the roof thatch, every aspect of the building, is incredible - and well-preserved. The particular wharenui featured below is called Hotunui and was originally a wedding gift presented between two tribes, from the Ngati Awa to a member of the Ngati Maru. Inside the partially-restored wharenui Hotunui. Over the last week my research team and I have run into a number of small setbacks in testing. We will be running our first test tomorrow morning and hopefully it will run smoothly! As the testing progresses on our concrete beam I'll be sure to provide a little more technical update on what I have been learning and working, so stay tuned!